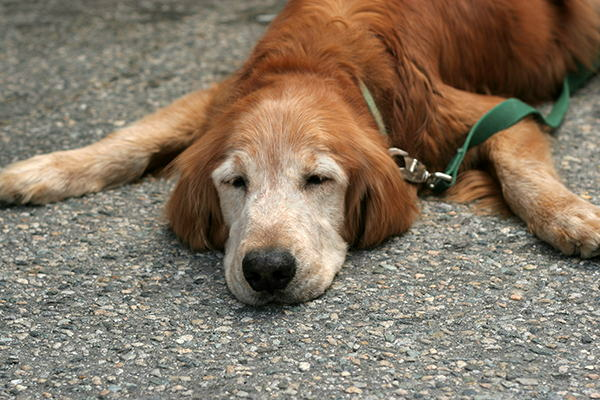 Arthritis is very common in older pets. Many pet owners first notice arthritis, or joint pain and inflammation, when their dog or cat seems to be having trouble getting around. But pets are sometimes good at tolerating pain, and many have undiagnosed arthritis. Routine veterinary visits are often the key to identifying dog and cat arthritis. Vets are trained to notice arthritic symptoms that might not be obvious to owners, who see their pets every day. For example, being careful is a symptom that’s easily overlooked. Your dog might not be limping or showing signs of discomfort, but as he walks around he’s taking care not to bump his hips into anything. With an expert eye, a veterinarian sees this as a sign of something deeper. In a similar way, your pet might have arthritic back pain without showing it. Because you always touch your pet in a gentle, loving way, you don’t see signs of pain. When a veterinarian probes along the spine during an exam, suddenly the discomfort is obvious. When arthritis is suspected, it’s definitely time for a vet visit. Here are some common signs of arthritis in dogs and cats. Limping. Pain could be affecting your pet’s gait, or causing them to favor one paw or side. Slow or difficult movement. This is a classic sign of arthritis. Hunching. If your pet’s spine seems different, they could be hunching over due to soreness or lameness. Fatigue. Is your pet sleeping more than usual? Ask a vet whether this could indicate arthritis. Snappishness. A gradual onset of snapping at hands or pulling away quickly from touch can indicate an animal in pain. Weight or muscle loss. Muscle atrophy and overall weight loss are early indicators of arthritis. Excessive licking or chewing. As your pet tries to deal with pain, their response might be licking or chewing on body parts. Sometimes they’ll chew on their paw, even though the pain is in their back. They’re desperate for relief. When you bring your pet in for an arthritis evaluation, the vet will observe their behavior and look for signs of lameness, pain, and restricted mobility. An x-ray may be performed to look for degeneration and inflammation. Osteoarthritis or dysplasia are common diagnoses. Your pet may have misaligned stress points, joint problems, and worn cartilage. Their blood vessels may be dilated, with swelling deep within the body. Calcium deposits and joint stiffness are likely. Your vet will likely be concerned with weight loss and gain, because of the way arthritis affects your pet’s long-term health outlook. At first, your pet may lose weight as they try to cope with the pain. Over time, they may lose mobility and therefore gain weight. The vet will advise you on things that will improve your pet’s ability to cope, like pain control, exercise, diet, and adjustments to your home environment. Although arthritis is usually permanent and degenerative, your pet can still live a very long and happy life. Concerned about arthritis? Schedule a visit with the pet experts at Academy Animal Hospital.